Discussion in 'Canon InkJet Printers' started by martincregg, Feb 26, 2017. 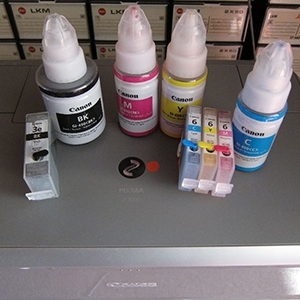 I got the cartridge from Precision Colors. Filled it once and as soon as the Pro-100 registered low I refilled. Just came to check on how the sponges were looking and this is what I see. Is this normal? I thought the bottom sponge layer was supposed to be a solid color. The cartridge looks perfectly normal to me, see this thread. It's fine. Don't forget, it's partly empty. Ok. None of my other carts look like this so wondered if I had refilled it incorrectly or something.